Clever Ways To Make Smores At Home: Campfire Cones Are A Fun Idea For Kids, Parties, Camping, Or Anytime You Want A Sweet Treat! Campfire Cones are the perfect sweet treat for kids of all ages — a great alternative to traditional Campfire Smores. Here’s my favorite Campfire Cones recipe and tasty Smores ideas that work well inside waffle cones. These can be made at home in the oven, on the grill, or on a campfire! Chocolate dipped bugs — including chocolate covered crickets and chocolate covered grasshoppers — are the latest food sensation that everyone’s buzzing about. Here’s where to buy them, and ways to make some unusual chocolate dipped foods yourself. 3 Ways That Dark Chocolate Benefits Health: It’s A Superfood! Chocoholics rejoice! There are 3 new reasons that dark chocolate benefits health enough to raise it to superfood status. Finally, the chocolate bar with almonds is recognized for all of its health benefits. 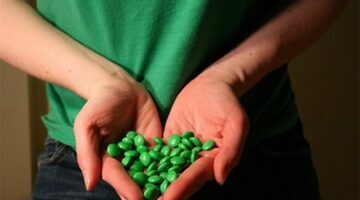 Go Green With M&M’s… What’s All This Hype About Green M&Ms Anyway? Here’s everything you want to know about Green M&M’s and some reasons you might want to go green with your favorite candy this year. Green is the new pink… right? Get your FREE M&M’s here! That’s right, the Mars company has announced a promo code that gets you a FREE bag of M&M’s with your online order of personalized M&Ms.